Limitation of space allows only a selection of papers to be listed. Enzyme reactions in reverse micelles (A. Gupte, R. Nagarajan, A. Kilara). Stir-fried/sauté flavors - recent developments in the U.S.A. (A.S. Kiratsous, M. Ishikawa). Optimization of virgin olive oil quality in relation to fruit ripening and storage (E. Monteleone et al.). Influence of dips, modified atmospheric packaging, and storage time on the enzymatic discoloration of processed raw potatoes (J.A. Maga). Nutrition in the critically ill infant (D.E. Withington). Volatile nitrosamines in foods - an update (R.A. Scanlan). Acceleration of flavour formation during cheese ripening (M. El Soda). Screening for antioxidant activity of essential oils obtained from spices (V. Lagouri, D. Boskou). Application of GC-MS analysis for studies on biosynthesis of lower terpenes incorporating deuterated precursors in plant cultured cells (K. Nabeta). Isolation and identification of off-flavor components from soy milk (L. Hashim, H. Chaveron). Interactions between polysaccharides and aroma compounds (S. Langourieux, J. Crouzet). Enzyme generation of free amino acids and its nutritional significance in processed pork meats (F. Toldra, M. Flores, M-C. Aristoy). Studies on the hydrolysis of fish protein by enzymatic treatment (A.M. Martin, D. Porter). Fresh orange juice flavor: a quantitative and qualitative determination of the volatile constituents (M.G. Moshonas, P.E. Shaw). Peanut flavor formation during roasting as affected by atmospheric conditions (R.Y.-Y. Chiou, C-Y. Tseng). The contribution of oak lactone to the aroma of wood-aged wine (J.R. Piggott, J.M. Conner, J.L. Melvin). Investigation of flavour compounds in whiskey spent lees (K. MacNamara et al.). Food production in arid and desert areas using the "Kallidendron" technology (G. Kallistratos, P. Drakatos, I.-M. Kallistratos). Subject Index. 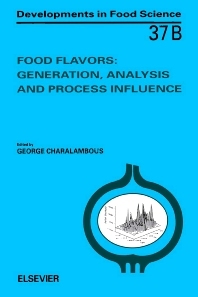 In this book, major emphasis is placed on the effects of processing and food components upon the flavor of foods and beverages. Topics discussed include: roasting of peanuts; extrusion of cooking poultry; spray drying of natural flavor materials; cooking rates of foods; gamma radiation of packaging films; stir-frying of sautéd flavors; emulsification properties of egg yolk and lupin proteins; the interaction of flavor compounds with flour, starch, and polysaccharides; factors affecting development of flavor in whisky, wines, fermented products, alcohol precursors, and model food systems; applications of enzymes for production of flavor in fish, lobster and pork; and the development and application of analytical methods for isolation and identification of volatile compounds and flavors from a variety of food products. Information presented in this book will be useful to chemists, scientists, and technologists working in flavor chemistry, food product research and development, and food quality control.